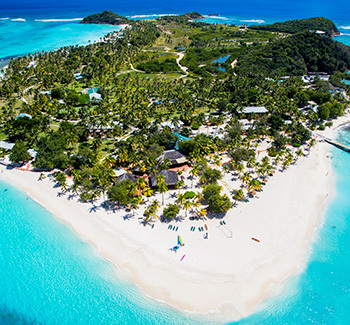 Imagine an island paradise in the Grenadines chain accessible only by boat, with just 42 rooms and 135-acres of tropical grounds as your own private playground. There are 5 pristine white-sand beaches where many times, you’ll be the only person to grace their sands. The accommodations are without a phone and TV, so you can truly disconnect and rediscover the wonder of nature as you slow down, relax and recharge. With two beachfront restaurants, a brand new luxurious Spa, all-inclusive watersports and a variety of sailing trips to explore nearby islands, you’ll have plenty of options for winding down or amping up your vacation. Escape to Palm Island Resort & Spa and experience Caribbean private island bliss.